The waiting, as one Thomas Earl Petty once sang, is the hardest part. Last week had its share. Anticipation of the release of FOMC minutes on Wednesday, and the first batch of big bank earnings on Friday, made for some relatively quiet trading sessions. 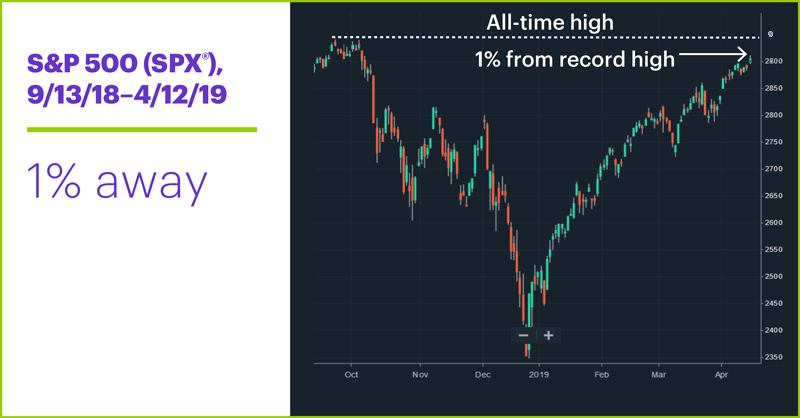 But patient bulls got their reward: Before the closing bell rang on Friday, the S&P 500 (SPX) had pushed to within 1% of its all-time high—its highest level since October 4. Sector breakdown: The top-performing S&P 500 sectors last week were financials (+2.1%), communications services (+1.5%), and information technology (+1.1%). The worst-performing sectors were health care (-2.5%), energy (-0.3%), and utilities (+0.2%). Power Moves: Global Brass and Copper Holdings (BRSS) jumped 25% on Wednesday. On the downside, Hollysys Automation Technologies (HOLI) and Zogenix (ZGNX) both shed 23% on Tuesday. One of the biggest moves, though, came on Friday, when shareholders of Andarko Petroleum (APC) woke up to a 32% gain on news Chevron (CVX) was acquiring it in a $33 billion deal. That overshadowed Disney’s (DIS) 12% intraday jump following the announcement of its Disney+ streaming service. And one other move that wasn’t nearly as big, but still notable: Website design software maker WIX (WIX) jumped more than 3% intraday to a new record high on Friday (see “Stock coils like a snake, options traders strike”). The week’s three IPOs—Tufin Software Technologies (TUFN), PagerDuty (PD), and Jumia (JMIA)—all got off to hots starts, each jumping 25% or more on their first days. Futures action: After rallying as high as $64.71/barrel on Wednesday, June WTI crude oil (CLM9) drifted mostly sideways to close Friday around $64. June gold (GCM9) rallied close to $1,315/ounce last Wednesday before dropping around 1.4% on Thursday and closing the week around $1.294. Don’t forget this is a shortened week—markets will be closed (or have limited trading) on Good Friday. [T]he evolution of the economic outlook and risks to the outlook would likely warrant leaving the target range unchanged for the remainder of the year. Market has shown some spring in its step. Stocks have not abandoned their record pace in the first couple of weeks following the Q1 uber rally: The SPX’s 15.98% YTD gain is bigger than it’s been at the same point in all but two years (1975 and 1987) since 1950. Market Easter eggs. 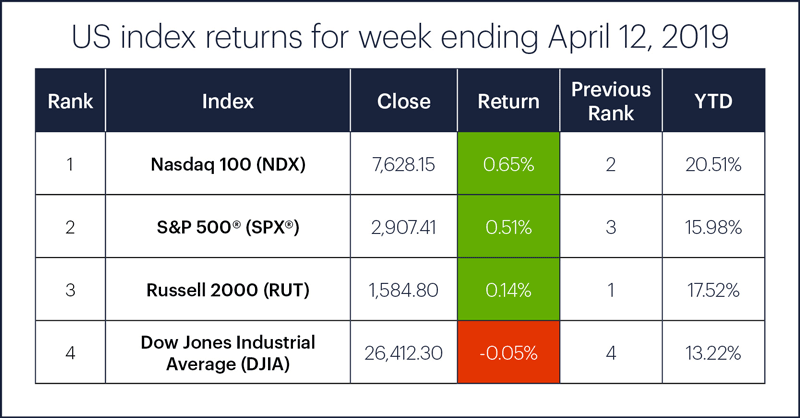 The four-day week leading up to Easter has been something of a mixed basket for the US stock market since 1997. Monday (today) and Thursday were up days more often than not, while Tuesday and Wednesday were more likely to be down days. The days with the strongest tendencies were Wednesday (down 14 of 21 years) and Thursday (up 15 of 21 years). 1 Bloomberg.com. S&P 500 Nears Record on Bank Earnings; Bonds Fall: Markets Wrap. 4/12/19. 2 MarketWatch.com. S&P 500 on course to snap 8-day winning streak after Trump tariff threat. 4/9/19. 3 CNBC.com. Fed officials are leaving the door open for more rate hikes if the economy improves, minutes say. 4/10/19. 4 FederalReserve.gov. Minutes of the Federal Open Market Committee, March 19-20, 2019. 4/10/19.